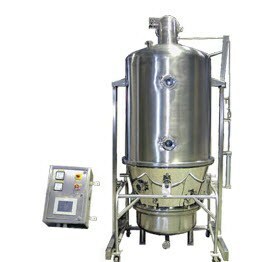 FLUID BED DRYER" is providing compactness and conceptional principle of Air Fluidization for drying granules, crystalline, coarse or similar materials in Pharmaceuticals, Fine Chemicals, Dyes, Food & Allied Industries. The basic concept of the Fluid Bed System begins with a simple Drying unit to which several different optional packages may be added for conversion to a granulation or coater. The Fluid Bed Dryer is not suitable for drying liquids or pasty materials. FLUID BED DRYER is designed to introduce the hot air stream at the base of the product container which is filled with the material. This hot air stream expands the bed of material at certain velocity & creating turbulance in the product. The phenomenon is known as fluidisation and offer conditions which are almost ideal for drying. Heat transfer is extremely high and uniform. The product is dried fast without appreciable loss of heat. Filter bags prevent particles escaping from the dryer. CAPACITY: ranging from 10 / 30 / 60 / 120 / 150 / 200 / 250 / 300 / 500 Kgs., with steam heating / electrical heating & thermal heating facility. Fluid Bed Dryer uses less floor space. Can dry material in less time than a tray dryer. Temperature distribution through out the product is uniform and the heat transfer rate is very high. The dryer can effectively be used for heat sensitive products. There are no threads in Dynamic Engitech Pvt. Ltd Fluid Bed Dryer Reviews at this time.